Audi Q3 revealed, April 2011 | What Car? This is our first look at the Audi Q3, the companys smallest crossover to date. The Q3 is slightly longer than the current A3 and is almost as tall as the Q5 making it a premium rival for the likes of the Mini Countryman when its launched later this year. The sloped roofline also gives the Q3 the sleek profile of a coupe, while boot space of 460 litres gives it the added element of practicality desired by families. There will be four 2.0-litre engines available from launch: two petrols and two diesels. Power ranges from 138bhp with the 2.0 TDI 140 up to 208bhp in the 2.0 TFSI 211 unit. The lower-powered petrol and diesel get two-wheel drive and a six-speed manual gearbox as standard. The other two engines will come with Audis quattro four-wheel-drive system and S tronic seven-speed semi-auto transmission. Standard equipment includes alloy wheels, air-conditioning, and an MP3 connection, while cost options range from a storage package and climate control to a panoramic sunroof and heated electric seats. 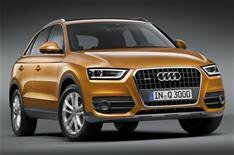 The Q3 will go on sale in June, with the base model costing 29,900 (around 26,597) in Germany.